Home » Post tagged "renaissance"
The "Renaissance" is rightly hailed as one of the watershed eras of Western civilization, the people found the impetus and the inspiration to throw off the shackles of medievalism. It was a time of great cultural resurgence, exploration, and scientific advancement…for better or for worse, as some might say! Nevertheless, the Renaissance happened and there's no going back. But there can be progress forward. When my family and I visited England for a few weeks in August, 2018, we came across a series of books published by Oxford University Press under the theme of "A Very Short Introduction." The first such volume, Shakespeare: A Very Short Introduction, is one we picked up in the bard's hometown of Stratford-upon-Avon, and we enjoyed not only the concise presentation but also the physical comfort of the book's compact size. Thereafter, as we visited other sites like Bridgenorth, Ironbridge, the Derwent Valley, various English Heritage sites, York, and finally the London museums, we found a number of other volumes in the series that added greatly to our understanding of the world without adding greatly to the weight of our luggage! One of the other titles I picked out in the British Museum, after looking over the collections from ancient Greece, was Classical Literature: A Very Short Introduction. I was particular interested in the subject as I'm looking to transition my own career from technical and instructive writing to more literary work. Classical literature, as Western civilization defines it, is composed of primarily Greek and Roman works that originate in the twelve-hundred years between around 700BCE and 500CE. It actually goes back a little farther, as Homer's Iliad and Odyssey are considered to be the beginning of the classical era and, ironically, its best works! Renaissance, (French: “Rebirth”) period in European civilization immediately following the Middle Ages and conventionally held to have been characterized by a surge of interest in Classical scholarship and values. The Renaissance also witnessed the discovery and exploration of new continents, the substitution of the Copernican for the Ptolemaic system of astronomy, the decline of the feudal system and the growth of commerce, and the invention or application of such potentially powerful innovations as paper, printing, the mariner’s compass, and gunpowder. To the scholars and thinkers of the day, however, it was primarily a time of the revival of Classical learning and wisdom after a long period of cultural decline and stagnation. The Renaissance, certainly, forged the foundations from which present-day Western civilization has grown. And yet, that civilization–including much of the world that emulates or wishes to emulate the West–is certainly not lacking challenges, perhaps even existential ones, and would, with equal certainty, benefit from another round of rebirth and renewal: a second Renaissance. I say this not necessarily from a standpoint of criticism, but from a standpoint of wondering whether we've become too complacent with the cultural achievements of the 15th century Renaissance. After all, the Renaissance happened more than half a millennium ago! Isn't it odd the degree to which we still identify ourselves with values from what is not far from becoming ancient history itself? And for as much as we still like to draw from classical history and literature, are we missing an opportunity to perhaps look even farther back to a time when ancient cultures were even more like our own? The context for this last question, especially, is the profound cyclical view of historical evolution known as the yuga cycles, an ancient tradition of India (and other cultures) that's been brought to modern awareness through works like Paramhansa Yogananda's Autobiography of a Yogi (Chapter 16 in particular), and the exploration of the subject by Joseph Selbie and David Steinmetz in The Yugas: Keys to Understanding Our Hidden Past, Emerging Energy Age, and Enlightened Future. The basic idea is that humankind's general level of spiritual awareness goes through a series of ascending and descending ages, known from the Greek historians as the golden, silver, bronze, and iron ages. 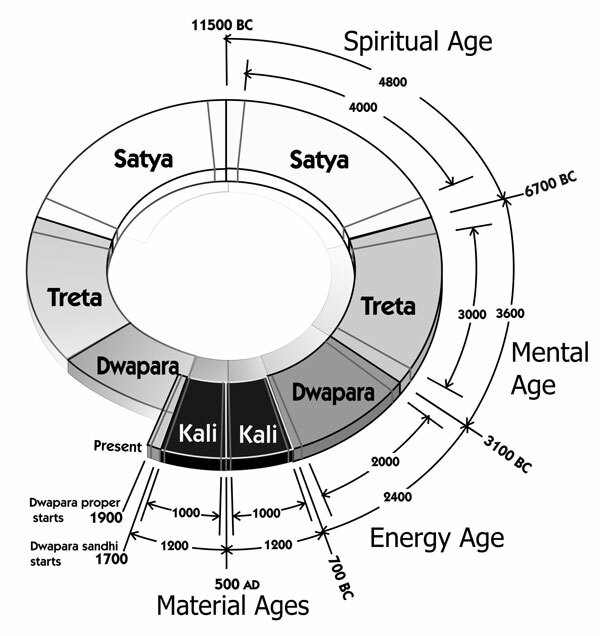 As you might expect, general spiritual awareness is highest in the golden age (Satya Yuga), then gradually diminishes through the descending arc of the silver and bronze ages (Treta Yuga and Dwapara Yuga, respectively), eventually to be almost entirely lost in the iron or material age (Kali Yuga). From that nadir, then, awareness gradually increases back upwards through iron, bronze, silver, and golden ages once again. Yogananda's explanation of the yugas presented the foundational work done by his guru, Swami Sri Yukteswar, in The Holy Science, published in 1894. Sri Yukteswar sought to clarify and correct certain miscalculations in the traditional Indian reckoning of the yuga cycles. That tradition maintains that we're only a few thousand years into the descending arc of the lowest and darkest age of Kali Yuga, which supposedly started in 3100BCE and is said to last 432,000 years! The implication is that all the toil and suffering we see in the world today will only get increasingly worse, which paints an extremely dim prospect for humanity's future. And even if we somehow manage to scape a few survivors through what would surely be eons of untold anguish, it would take another 432,000 years to crawl back upwards through the ascending arc to get to the next bronze age. If you ask me, I'd opt to find another planet altogether! Sri Yukteswar, however, said that during the transition between the last descending Dwapara Yuga and Kali Yuga, various misinterpretations multiplied the timespan by a factor of 360 (the number of human years in one "divine year"). Thus instead of an utterly depressing 432,000 years, both descending and ascending arcs of Kali Yuga are only 1200 years long. Furthermore, we've already long passed the nadir, which occurred in 500 CE; in fact, we've also passed through the entire upward Kali Yuga arc, which began to transition to the 2400-year Dwapara Yuga in 1700CE. With the transition ending in 1900CE, Yukteswar said, we entered the Dwapara Yuga proper in 1900CE. Where Kali Yuga is called the iron or material age, Dwapara Yuga is the bronze age or the age of energy. Can anyone doubt that energy is the hallmark of the modern era? Nearly everything we know where science and technology are concerned, and especially with energy, has been discovered or greatly refined since 1900CE. That fact alone is enough to corroborate Yukteswar's reckoning. And it's certainly cause for much greater hope than the utterly depressing alternative. With this background, we find that the age of classical literature, from 700BCE to 500CE, precisely overlaps the descending arc of Kali Yuga. And that's the period upon which the Renaissance of the 1400s and 1500s, in the ascending arc Kali Yuga, is founded. Indeed, if we arrange the descending and ascending arcs of the ages as parallel lines, as Selbie and Steinmetz do in The Yugas, we see that the Renaissance in the ascending arc lines up with the "Golden Age of Greece" in the descending arc. (Because the whole cycle of time is conventionally shown in a clockwise direction, the ascending ages are on the left side.) Thus it was entirely appropriate that the Renaissance drew from classical literature for its inspiration. But what of us today, 500-plus years later? Looking back to classical literature is, in effect, somewhat "backwards" in that it looks to an age that is increasingly unlike ours, and that it doesn't look back far enough. Typical Western scholarship, of course, generally believes that there isn't anything worth looking to farther back than the classical era. It believes that just about everything that came beforehand was primitive or savage. Yet archaeology has been repeatedly demonstrating that there is a very rich cultural heritage from the descending arc of Dwapara Yuga. Ancient Hebrew texts, for example, including much of the Old Testament, are from that time. There is also an incredibly rich cultural and literary heritage from India, such as the Rig Veda, which was already old at the time, and the Sanskrit language itself, which was already fully developed. Indeed, drawing a line across the yugas from our modern era places us not in the classical period, but in the era of 1000BCE and a few centuries earlier. Again, we're finding more and more archeological evidence that the world back then was not all that dissimilar from our world today, technology notwithstanding. For example, the book, 1177: The Year Civilization Collapsed (the title of which, while catchy, is an inaccurate representation of events that occurred over several centuries), describes a state of civilization with extensive international trade, international relations, and the powerful influence of the oligarchy. The theme of that book, I might add, asks whether our current state of civilization, being so similar to 1177, is also on the verge of collapse&mdash;the idea of a massive collapse is somewhat vogue today! Because we're in an ascending arc, however, I would think the opposite is true: although we may need to yet purge many lingering medieval vestiges, there is a growing sense of unity rather than dissolution. Many young people, for example, are seeing themselves as citizens of the world, rather than of one nation and one nation only. That's why increasingly open international trade, rather than protectionism, is the pattern for the future; we're gradually learning to be as concerned for the welfare of our brothers and sisters in every other part of the world in the same way that we think of our fellow countrymen today. Nationalism, in other words, is becoming obsolete. Having read Classical Literature: A Very Short Introduction, then, I've begin to look beyond the classical era to seek out the cultural legacy of the period between 1500-1000BCE. Instead of studying Latin, for example, I look now to Sanskrit (Hebrew would also be an option). Instead of drawing from Greece and Rome, I look to India, Egypt, and other cultures of the ancient near east. I wonder what I'll discover along the way. It's worth pointing out that some classical literature is based upon or follows the tradition of older material, and thus may more rightly belong to this earlier period. Homer's Iliad and Odyssey, for example, though they were written around 800BCE, were understood to be an oral tradition that went back somewhat further. Similarly, there are works in other cultures such as Patanjali's Yoga Surtras in India, that are reckoned to come from the second century BCE (or even to the fourth century CE), but are yet based on much older traditions. Thus I'm not necessarily discounting the typical classics, just casting the net further out. There is an urgent need today for a spiritual renaissance. The spirit of Christianity, not merely the form, needs revitalizing. This rebirth could not emerge from a tradition that for two thousand years has committed itself to defining Truth intellectually. Patterns of belief are the hardest of all habits to change. Rebirth had to come from outside established tradition, and free of the hypnosis of Church influence. The natural source for this renaissance was India, where religious freedom has always been cherished—even as political freedoms have come to be cherished in the West. It is not that Truth ever changes: People simply need to learn to perceive it more broadly, now that they are faced with new self-awareness and increasing knowledge of the universe. One advantage to living in the modern age is the contact that easy transport and communication have given us with peoples all over the world. Somewhere, in all this diversity, there may exist systems of thought that are different from our own, yet sufficiently like our own to be compatible with it. For what we want, essentially, is not to abandon that which is good in our own system, but only to infuse our system with new insights. This is what happened, for example, with the reawakened interest in Greek civilization that brought about the Renaissance in Italy. What we need today, in other words, is a New Renaissance. Yogananda's own work, in bringing the ancient teachings of India to the west, is, Kriyananda often said, the beginning of that new renaissance. I offer the prediction, then, that as our present age continues to develop, we'll gradually discover many previously unnoticed cultural treasures of the pre-classical era of ancient times. We may discover new layers of meaning within texts such as Egyptian hieroglyphics, which to date we've primarily tried to read as literal history or superstitious myth. We may find, as various authors and researchers demonstrate, that ancient myth is actually a form of encoded science, simply put into the form of stories because to store them in the cultural database of an oral (that is, "non-literate") culture. We might also find practical insights in the Vedas of ancient India, which are generally considered to deal strictly with spiritual or metaphysical subjects, but have been shown to contain knowledge of mathematics and the sciences. That our culture today could use deep renewal is almost beyond question, but I don't think we'll find it by continuing to look backwards to the medieval Renaissance. It's time we begin a second Renaissance of our own.